Panta Rei – restaurant that will steal your heart after the first bite. 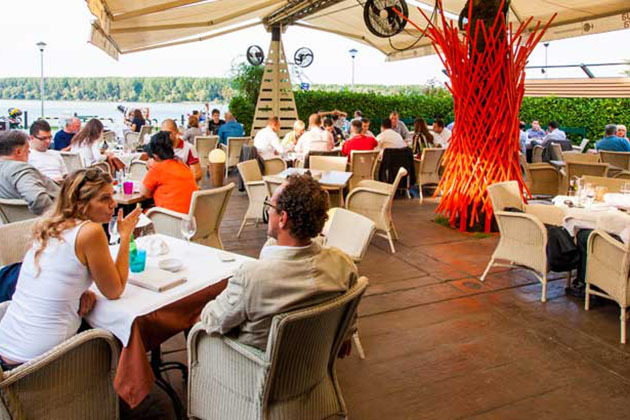 It’s located at exclusive location right next to the Danube River. Panta Rei, which in translation from Greek means “everything changes”, is well known restaurant in Belgrade that has been here for over 20 years. Known for tasteful meals and great atmosphere, it has been visited by many celebrities from Serbia and region. Themed with brown and beige color, interior looks remarkable. Panta Rei can accommodate around 200 people including both inside and outside areas. There are various choices in menu: from salads and appetizers, to main courses and desserts. Beautiful view on Danube River trough glass “walls” will complete your overall experience.